A deeper look at the grooves pressed into the …And Out Come The Wolves (5 x 7” vinyl set) by Rancid. It sounds a little sensationalist to make this declaration but, of the albums which really sparked the punk revival of the 1990s (including â€“ but certainly not limited to â€“ Punk In Drublic by NOFX, Stranger Than Fiction by Bad Religion, Dookie by Green Day and Smash by the Offspring), it was Rancid who ran closest and truest to the sound and form of the old school and really tried to bring punk as it was to the mainstream â€“ not ambitiously polishing it and making it palatable to the mainstream. A little late of the big explosion [the band’s sophomore effort, Let’s Go, caught that â€“ed], Rancid’s third album, …And Out Come The Wolves, shows listeners what music was being made all over North America, in dingy clubs like Gilman St., and at parties; snapshots of the East Bay in San Francisco are written into the songs on …And Out Come The Wolves, as are the shadows of New York and the more organic growth of Olympia, and they all converge to present the statement that Rancid’s already seen the change coming because they were there; they played the dingy rooms and found the kids who felt the same way they do in those big cities, and now they’re coming to convert all the rest in their bedrooms as they listen. In 1995, the possibility was intoxicating for problem children all over the world, and …And Out Came The Wolves not only proved to make Rancid superstars, the album continues to win new fans twenty years after its release (even now, it continues to sell millions of digital copies). Going above and beyond that though, Rancid has taken the music back to basics and released it as a set of five vinyl 7” EPs in the Rancid Essentials box set. In re-contextualizing the music on the 7” format, …And Out Come The Wolves really does breathe new life as the format casts new light on deeper cuts in the album’s running, and the tasteful remastering job applied makes all the songs play more vividly. Simply put, these songs have never sounded as good as they do here. In this context and with the pacing of the 7” format, …And Out Come The Wolves plays differently without question â€“ but it listeners will actually be able to feel it as â€œMaxwell Murdersâ€ ravages them at the beginning of EP1. There, the droning, dissonant tone which opens the song sounds crisper now (somehow) than it did on the CD; Matt Freeman’s bass sounds limber and lean and it’s possible to pick out every note of his famous, supercharged bass solo instead of just witnessing them all blur by. Even better too, the vocal presences of both Lars Frederiksen and Tim Armstrong remain very acerbic in tone here, but the clarity with which they’re presented proves to be very affecting â€“ you’ll start sneering and scowling far earlier in the running of this set than you ever did before reader, that’s a promise. After the introduction’s made, â€œThe 11th Hourâ€ keeps the record’s energy up but listeners will discover how quick they have to be if they want to keep it moving smoothly and be ready to flip the proverbial 45 for the raw, stomping power of â€œRoots Radicalsâ€ and the ska swing of â€œTime Bombâ€ on the B-Side of EP1. Initially, such maneuvers may seem a little cumbersome and frustrating, but that sensation doesn’t last long. The quick movement required to not let the momentum of …And Out Come The Wolves lapse between sides and discs, while initially frustrating, quickly becomes the hook which holds listeners and actually helps to engage them physically. In this case, without a listener’s action, the music will stall because it runs out â€“ so they have to pay attention. That necessity is a great boon for some of the music on this album; the B-side of Disc Two, for example, feels positively stacked with power between the play of â€œJunkie Manâ€; there, the guitars crush listeners as Armstrong and Frederiksen both play their instruments as well as battle them for space in the mix, but then the assault parts to let Jim Carroll step up and spit out some well-honed spoken word stanzas (which happen to contain the album’s title) through the bridge. In this context, the performance of Armstrong, Frederiksen and Carroll feels like magic and, because it’s one of only two songs on the side, there’s no way to miss or lose it which makes it stand out brightly, but that the â€œotherâ€ song on the side is â€œListed MIAâ€ â€“ a great, tight and street-wise rocker helmed by Frederiksen â€“ just makes the presentation of the side feel sweet and satisfying as a whole. Again, Disc Three upholds a similar paradigm to the first two 7”s with the big hit â€œRuby Sohoâ€ leading the way but, unlike on the first two discs, the energy the energy struggles to build a bit as â€œDaly City Trainâ€ stumbles and demands that the EP be flipped (I’m sorry â€“ the song has always felt like a feeb to me, and the lyric â€œHe was an artist and a writer/ And a poet and a friend/ In a man’s life, he will take a fall/ But how low he goes, that just dependsâ€ continues to make me cringe) and then â€œJourney To The End of the East Bayâ€ and â€œShe’s Automaticâ€ both rock like beasts â€“ particularly with the leaner, cleaner and better production of these 45s. Here again, even though there is one weaker song, the 7” holds up well because it doesn’t leave time to dwell on the soft track which is great. Playing the EPs in order and the album front-to-back, that first stumble on EP3 almost seems to set the precedent for EP4 and actually lets it be the lull in the album’s running even if such a thing isn’t desired. It’s a little unfortunate, but undeniable that â€œOld Friend,â€ â€œDisorder and Disarrayâ€ and â€œYou Don’t Care Nothinâ€ all feel a little static-y and forgettable, but happily â€œThe War’s Endâ€ holds the fort with a coming-of-age story (of â€œLittle Sammyâ€ who discovers punk rock) and some rambling guitar changes which feel about as close to a CCR anthem as Rancid has ever come. Needless to say, EP3 is the weak link but, after such a strong showing through the first three discs, it’s understandable how eventually something would soften up and the upside to the vinyl is that the songs still aren’t as forgettable as they’d be on a CD, where they’d drown (and pretty much have since 1995, in this case). Finally, just as it did before, …And Out Come The Wolves ends strong and memorably with the comparatively abbreviated, three-track final EP. Even now, these last three songs feel like they might just be the manifesto at which all the hits and great moments earlier in the album’s running were driving. â€œAs Wickedâ€ turns the afterburners on and really ignites something as it examines the lost, lowdown and unsung folks dwelling in the gutter with more catharsis and a more realistic vision than Green Day has ever had when they’ve touched on similar themes. Not only that but, in listening, it feels like it might hit reasonably close to home for the members of Rancid; in listening, some threads raise which feel like they’re really touching Frederiksen and Armstrong as if they not only know the characters, they’ve shared a square of sidewalk sleeping space with them before. Perhaps because of that, there are no hard words or feelings anywhere in the song, just heart â€“ and that heart carries over into â€œThe Way I Feel” to close out the record warmly and loudly. To this day, twenty years after the release of …And Out Come The Wolves, â€œThe Way I Feel plays like the most heartbreaking, raging punk song I know. Lyrically, the song is perfectly conflicted as Armstrong and Frederiksen trade lines one-for-one and wrestle with the ideas of â€œlike,â€ â€œloveâ€ and â€œabandonmentâ€ as well as how to feel all of them when you’re faced with them (check out lines like â€œIf I knew then what I know that/ It would all turn out like this/ I’d sit back and I’d watch you squirm/ Cause you say I’m differentâ€) while the song itself just blazes through like it might burn up if it slows down. In that way, some might guess that the authoritative voice in the song is nervous or unsure but those who have heard it already know â€“ the voices in the song aren’t unsure, they know exactly where they’re going; the only question is how long it will take them to reach the top of the heap. As it would turn out, it didn’t take long at all. While …And Out Come The Wolves did come out late of the rope drop in the Nineties, it immediately placed Rancid in line with all of the frontrunners in the pack and landed the band a devoted following that they continue to keep twenty years later. Better still, it won Rancid some creative leeway and space to do what they wanted; there’s no argument that Rancid has made some mistakes and poor decisions since the release of …And Out Come The Wolves, but the album has convinced the notoriously fickle punk rock community to cut the band some slack; they have it in them to find a way back to the brilliance which produced this album, and they’ve done it regularly on a whim in the years since as a reward for letting the band push a few boundaries. 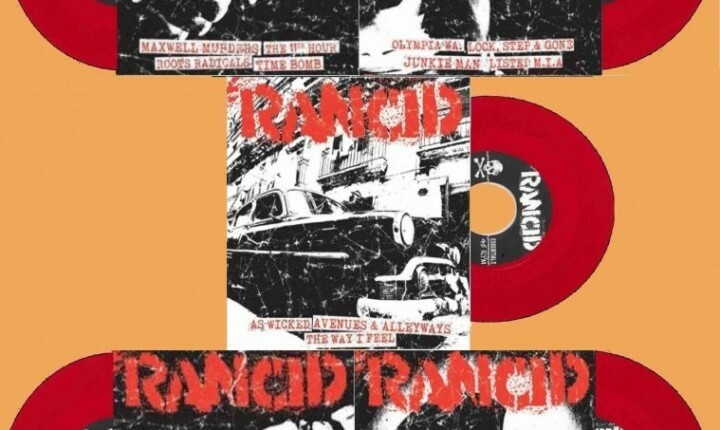 In many ways, this 7” reissue set feels a lot like that too; after twenty years, Rancid has given their fans a definitive presentation of an album they already knew they adored, but now they have new reasons to love it all over again.